The Crock-Pot 7-Quart Oval Manual Slow Cooker made of Stainless Steel is a slow cooker that is made to serve 8 people. It will hold up to 7 quarts of food. It has both high and low settings and a convenient warm setting. The warm setting is nice when you have food that is cooked and you want to keep it warm for hours. The warm setting also is great for parties or guests that come and go while fueling up on food. The Crock-Pot 7-Quart Oval Manual Slow Cooker features a removable, dishwasher-safe stoneware insert and dishwasher-safe glass lid. The exterior is made of polished silver stainless steel with black accents and plastic handles. Recipes are included in your purchase of this Crock Pot. I don't know about you, but I like buying from a company that has been around for awhile. It tells me something when a business has stood the test of time. The Crock-Pot brand is the original slower cooker. It has changed from a single bean cooker into a diverse and long line of slow cookers. Included are accessories that make meals easier and so much more convenient for the different ways that people cook today in this modern age. For families on the go, the Crock-Pot Slow Cookers offer solutions that are wholesome and healthy. These slow cookers are designed for portability and for giving the modern family new ways to continue enjoying their now very famous slow cookers. As of this writing The Crock-Pot 7 Quart Oval Manual Slow Cooker made of Stainless Steel has 1,132 reviews. I've read the reviews and condensed what people who bought this Crock-Pot said about it. I hope this helps you in your search for a slow cooker. For the large size of this Crock-Pot, the price is great. You can spend way more on a slow cooker of this size. But will you really be getting a better product? One person who did buy a higher priced slow cooker was more satisfied with The Crock-Pot 7 Quart Manual Slow Cooker. She wrote this about the price, "This is not only an excellent price for a large crock pot, but it works just as well or better than any slow cooker I've owned, and that includes a Weir programmable slow cooker costing $150!" It's nice to have a large enough size pot for when you have a large family or frequently have guests over. The Crock-Pot 7 Quart Oval Manual Slow Cooker made of Stainless Steel will hold 7 Quarts of soup, stew, or whatever you decide to put into it. One buyer wrote this about this Crock Pot's size, "We have a family of 8. I have used a LOT of crockpots over the years. For the price this one is the best hands down. No bells and whistles just a solid well made pot. It does cook on the hot side, but I like that." Keep in mind if you have a small family, you can still cook in a large Crock-Pot. I only cook for myself and my daughter, and our dogs that seem to know when to gather around for dinner. But I like cooking in a large Crock-Pot so that we will have left overs. Simply take the ceramic part (inner part) out of your refrigerator and set your Crock-Pot on whatever temperature you'd like depending on how fast you want it heated up. In summary, on the size factor, I think it's better to go bigger than small. Many of the customers who left reviews felt the same way. One person commented, "I had this version in a 4.5 quart and it just never seemed big enough. I am absolutely in love with this larger size. I no longer have to worry if I'll have enough room for all ingredients." The Crock-Pot 7 Quart Oval Manual Slow Cooker made of Stainless Steel has 3 temperature settings. The settings are Low, High, and Warm. This enables you to put a roast in early in the day and have it ready for dinner, keep something warm, or get soup cooking fast. Though there were some complaints on the settings being too hot or not hot enough, but overall most people said the settings were perfect. Make sure to follow a recipe if you want something to turn out exactly like it should in the allotted time. 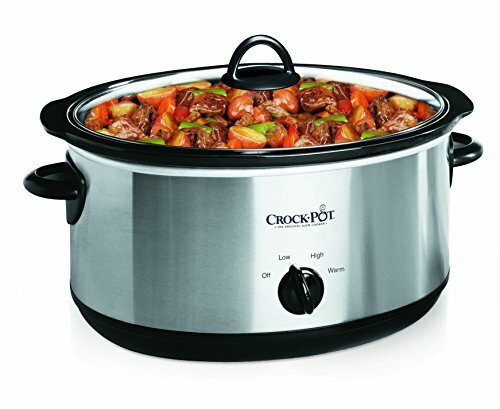 One happy buyer commented the following about the Crock-Pot 7 Quart Oval Manual Slow Cooker made of Stainless Steel. "This crockpot does what it's supposed to. Everything I have cooked in it has come out perfect so far. I make steel cut oats overnight in this and it doesn't overcook them like my old crockpot that I just replaced used to do. I also love the large size...It's perfect." Of course every individual has a different style. We all like different colors and shapes, etc. One thing that is nice about this Crock-Pot is that it can fit in with any kitchen or dining room decor. The Stainless Steel color is neutral as opposed to a bright red or yellow. I like the clean and simple look of this Crock-Pot. If you are wanting to give someone a slow cooker as a gift but are unsure about the color or decor, this would be a good neutral choice. The Crock-Pot 7 Quart Oval Manual Slow Cooker made of Stainless Steel is your basic large-sized slow cooker at a great price. Why spend more when you don't have to? The reviews were good and the company has been around for years. Sometimes it's comforting to buy from a well-known brand name because you know they've been doing something right to make it this long. If you want a large Crock-Pot, I'd say you can't go wrong with the Crock-Pot 7 Quart Oval Manual Slow Cooker made of Stainless Steel. To read all our Crock-Pot reviews, check out our article, The Top Ten Best Crock-Pots in 2018.